Identified as a new species in 2005 by Libby Houston and Tim Rich, this English endemic tree is found only in the Avon Gorge and the Wye valley. 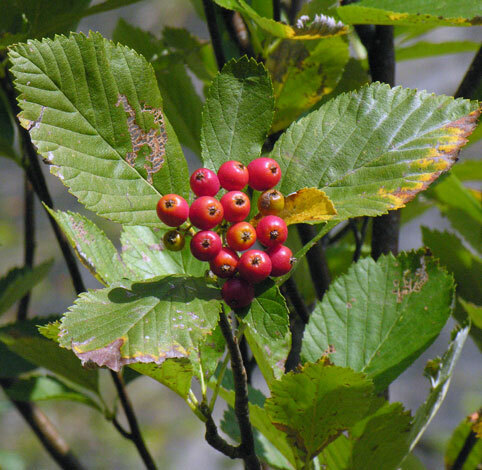 It had been confused with Sorbus wilmottiana (Wilmott's Whitebeam) and Sorbus hungarica in the past but a careful study of leaves and fruits led to the discovery of a new species - no mean feat in a country with the most studied flora in the world. Sorbus whiteana, a member of the Sorbus aria group, has obovate (egg shaped with the narrow end near the petiole or stalk) leaves which are greyish-white underneath compared with the distinctly whitish, tomentose underside of Sorbus aria. The red fruits typical of Sorbus aria agg. species are longer (polar diameter) than broad (equatorial diameter) in S. whiteana but since both S. whiteana and S. wilmottiana are derived from a cross between S. aria and S. porrigentiformis, the fruits of both are quite similar. Although Sorbus aria itself can be a large tree, Sorbus whiteana is one of many which remain relatively small in height when fully mature. It is estimated that there are about 76 Sorbus whiteana in these two sites.